The Grand Shar DB is immediately captivating, but only on closer inspection does the brand’s characteristic attention to detail become evident. A chronograph movement with state-of-the-art finishing, a sculptural case, pushpieces and horns with alternating polished and satin finishing, and a dial of contrasting volumes with recessed counters flanked by large elongated Roman numerals. Every detail is another testimony to Dubey & Schaldenbrand’s expertise. A nice new design from D&S, which I like very much. It combines Dubey’s unique case style with a more modern dial design and a raised bezel to give it an updated look and fresher feel. Kudos to Dubey on this one. 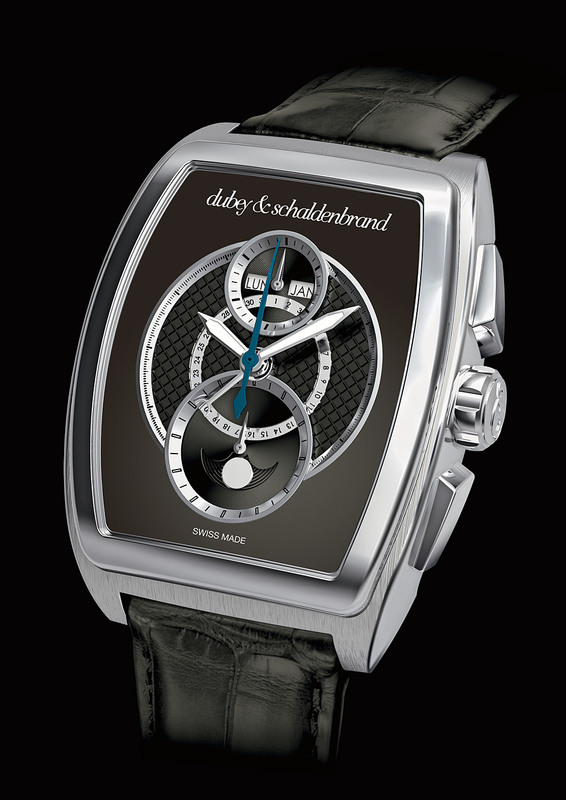 After seeing a large number of Dubey watches on the secondary market liquidation I was starting to wonder if they would go the way of many of the failed Watch companies of recent demi-decade. True to its heritage, the latest creation from Dubey & Schaldenbrand, the Grand Dôme DT, has taken the emblematic shape of the tonneau. And yet it couldn’t be more contemporary with its finely worked Valjoux 7751 chronograph movement, original interlacing circle design for the counters on the dial, and interplay of chequered guilloché and sunray satin finishing. A vertical arrangement of practical functions – date, day, month, moon phase and chronograph – for a balanced effect and excellent legibility. I’ve posted my video review of the D&B Aerodyn Big Date on Youtube, so I hope you guys enjoy it. Most people tend to say that this watch looks like a Franck Muller, but its got distinct differences and has a style of its own. 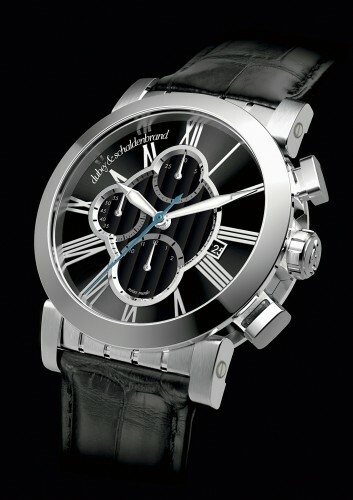 While this watch has a unique charm that not everyone can appreciate, I really do enjoy this watch and many of Dubey & Schaldenbrand’s designs. Look out Jaeger! Dubey & Schaldenbrand is looking to take a peice of the reverso pie with their new Spiral Verso VIP watch, launched this year at the Exposition Geneva! This is a very cool looking watch as you can see from the little video that the guys at Dubey put together. 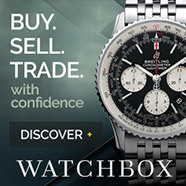 I’ve always been a fan.. and this one is definately one cool watch!